Does socioeconomic status affect mobility in older adults? Older adults with reduced mobility and a slower walking speed may have a lower quality of life. A recent study investigated if having a low socioeconomic status was a risk factor for slower walking speed and health in older adults. Aging is associated with many health problems. Modern medicine has been very successful in extending lifespan, but the quality of our life is just as important as the length. For this reason, medical researchers are increasingly focusing on healthy aging and attempting to determine what factors are associated with it. An important measure of health in older adults is how well they are able to carry out routine physical activities, such as walking. Walking speed declines with age, and older adults with lower walking speeds are more likely to be admitted to the hospital, to suffer from cognitive decline, and to have a shorter lifespan. A group of researchers from around the world recently combined the results from a large number of studies, carried out across the world, with the goal of determining how strongly a variety of health, behavioural, and social factors were related to walking speeds in older adults. Their findings were published in The BMJ, a journal of the British Medical Association. The researchers re-analyzed the results of 37 studies that had measured walking speed and collected data on the health and social status in older adults. These studies were conducted in 24 countries in Europe, North and South America, Africa and Asia, and had been carried out over the past three decades. They included just over 100,000 study participants, between 45 and 90 years of age, and equally divided between men and women. The studies collected data on health problems such as obesity, high blood pressure, and diabetes, along with behavioural risk factors such as smoking, high alcohol consumption, and physical inactivity. The researchers estimated socioeconomic status based on the type of jobs reported by the participants. For example, an unskilled worker would be considered to be of low socioeconomic status, whereas a high-level manager or professional would be considered to be of high socioeconomic class. As expected, the researchers found that walking speed was significantly lower in older adults compared to younger adults. In men, average walking speed decreased from 1.2 meters/second (3.9 feet/second) at 45 years of age to 0.95 meters/second (3.1 feet/second) at 90 years. For women, it decreased from 1.15 meters/second (3.8 feet/second) to 0.81 meters/second (2.7 feet/second). For both genders, the age-related decline in walking speed started to accelerate between 65 and 70 years of age. In general, older adults who suffered from health problems such as diabetes, high blood pressure, or obesity had slower walking speeds. Men or women with any of those conditions had, on average, the same walking speed as healthier participants who were several years older. Sixty-year-olds who were obese had diabetes or were physical inactive walked at the same speed as healthier participants who were six years older. Those who smoked or had high blood pressure walked at the same speed as non-smokers or non-high blood pressure study participants who were one to three years older. Sixty-year-olds with low socioeconomic status had the same walking speed as high socioeconomic status 66-year-olds. The only risk factor that wasn’t associated with slower walking speeds was high alcohol consumption. For the most part, there were no major differences between men and women. The researchers found the same patterns in 85-year-olds. In fact, many of the risk factors had even stronger effects at this age. For example, 85-year-olds with a low socioeconomic status had the same average walking speed as 94-year-olds of high socioeconomic status. Socioeconomic status had the strongest effect on study participants from high-income countries such as the United States. In low- and middle-income countries, participants with a high socioeconomic status had only a two to three-year advantage over those with a low socioeconomic status. Several of the studies kept track of the study participants for many years after they measured walking speed. The researchers used this data to estimate the effect of the potential risk factors on mortality rates between the ages of 60 and 85 years. They found that low socioeconomic status, high blood pressure, diabetes, physical inactivity, high alcohol intake or smoking were all associated with a significantly shorter average lifespan. The difference in lifespan ranged from 2 to 17 months. Obesity shortened lifespan in women, but not men. The researchers pointed out that their study had several limitations. It was based upon data collected by a large number of earlier studies, many of which measured walking speed in slightly different ways. Also, these were strictly observational studies, with no experimental intervention. Therefore they can only conclude that there was a relationship between these health risks and walking speed, but they could not prove that one causes the other. Finally, the type of job someone had may not be perfectly predictive of socioeconomic class. This is especially true of older adults, who may have been retired for many years. 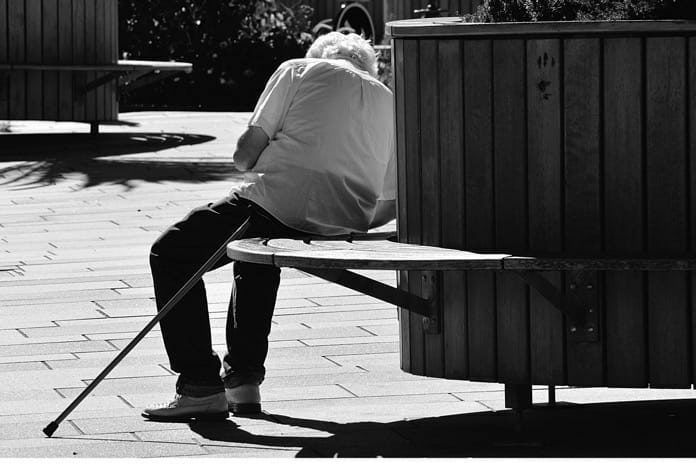 Despite these potential issues, this study suggests that having a low socioeconomic status is a risk factor for decreased mobility in older age, with an effect comparable to traditional health risks such as obesity or age-dependent disease such as diabetes. The age-related loss of walking ability is accelerated by several years in older adults of low socioeconomic status. In contrast, life expectancy was shortened by less than a year. This suggests that low socioeconomic status is associated with a longer period of poor health and low quality of life in older adults. The researchers suggest that health policies meant to ensure healthy aging should take socioeconomic status into account.